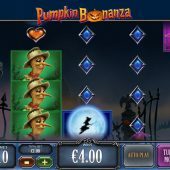 Pumpkin Bonanza slot is Playtech's latest Halloween edition as the bigger developers always tend to churn out a new 'spooky' game at that time of year, some with better results than others. Previously we've had Microgaming's Halloweenies and last time out Playtech produced Halloween Fortune but the real horror slot was Microgaming's last one - Halloween, based on the slasher film of the same name. Here though we have a pretty plain-looking game with cartoon icons and transparent reels over a background of a haunted nightscape where pumpkins grow and some creepy music which somehow doesn't sit right with the graphics. The game certainly doesn't scare the hell out of me, but will it put the frighteners on our bankroll? We have a very basic game here with few shocks or surprises in store unfortunately, the exception being the fact we have a large grid with 5 reels of 4 rows each and only 10 paying lines, which I'd not seen before IGT's recent Wild Fury slot. What do they say about buses? Anyway, here at least they pay both ways from right-to-left too and the symbols are all stacked. The pays for 5-of-a-kinds are not huge by any means; the Moon pays 50x bet, Witch 10x, Scarecrow 7.5x with 4 card suits paying 5, 4 or 2.5x for the lowest two. A clue to how basic Pumpkin Bonanza is will be found in the fact that there are no scatters or Wilds appearing on the reels - so what does it actually do? The only feature occurs when you get a potential win from both right-to-left and left-to-right, in other words there are two matching symbols on a paying line on both reels 1, 2 and 4, 5. When this happens you'll hear a deep voice saying 'trick or treat!' then all symbols on the centre reel that could potentially make a win will turn into Pumpkin Wilds. 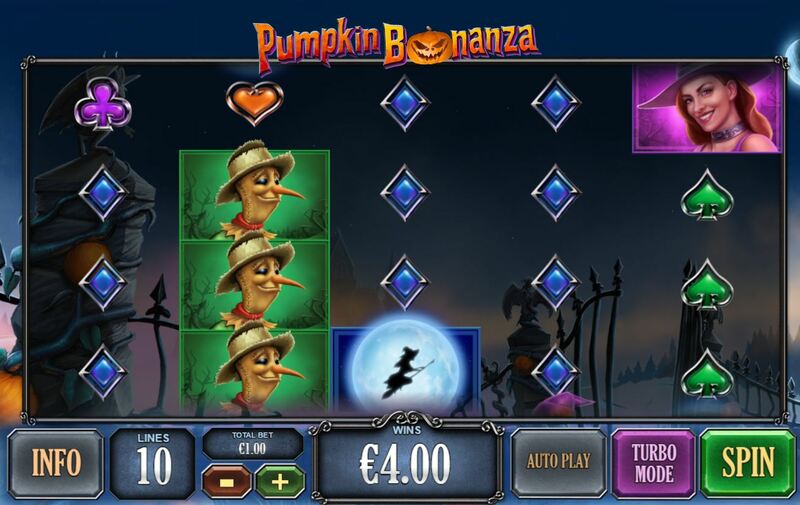 You should get a win here, but not always - if you do then all winning symbols on this triggering spin will turn into Pumpkin Wilds on the centre 3 reels after a big Pumpkin appears and shouts 'Pumpkin Bonanza!'. So you will see a stream of Pumpkin Wilds added to those 3 reels as they spin and you can land none to all 12 centre positions as Wild in this re-spin. If you get full stacks of Moons either end then you would have hit the game's top pay, 500x stake!